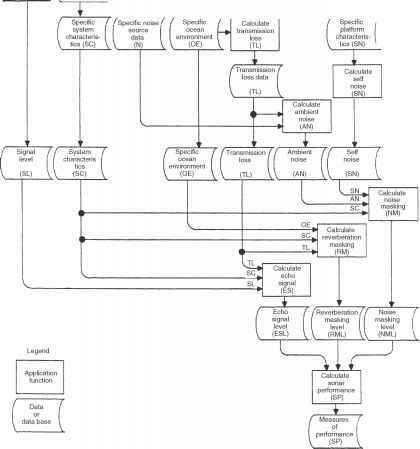 Figure 10.12 Sample acoustic modeling data flow concept showing model operating system application functions for the active sonar equation (Locklin and Etter, 1988). describes the nature of the signal reflected from the target and considers the effects of target strength (TS), as specified in the active sonar equation. Furthermore, the beam pattern (BP) function is implicit in the system characteristics (SC) function. The final SP function would then contain the algorithms necessary to generate signal excess and probability of detection outputs. An important consideration for Figures 10.11 and 10.12 involves the usage of "EXTRACT" and "CALCULATE," and the symbols denoting application functions and data. "EXTRACT" implies such operations as database access, retrieval, reformatting and output in a standard form and includes the computational algorithms necessary to prepare the required data. "CALCULATE" implies that the primary emphasis is placed on some computational model or algorithm, with all input and output handled by standardized file interface utilities. The application functions shown in Figures 10.11 and 10.12 are the highest level of modularization envisioned in these particular representations. A further decomposition may be possible depending upon the particular requirements of the MOS. Each identified function would be associated with families of software application programs and associated data storage facilities. Model operating systems, by design, facilitate and thus encourage the generation of multiple solutions for any given sonar performance problem. Divergent answers obtained from different models can alert the user to potential problems in either the problem specification or in the underlying physics of the model (i.e. a violation of the domains of applicability or an unexpected modeling pathology). Unexplained divergences can be graphically represented by envelopes illustrating the spread in predictions. Many criteria drive the design of any particular MOS. Design decisions will likely entail tradeoffs between cost and ease of use, and between accuracy and understanding. Some degree of compromise will be involved. There is always the danger of "creeping elegance" in which product embellishments not contained in the original design specifications add to the life-cycle costs and delay the implementation schedule. There is also a common desire expressed by potential MOS users to obtain "all the information" generated by the models. While noble in principle, what is usually more important in practice is how the information is presented. Creative visualization techniques that logically combine essential information on a very few charts are highly desirable. The generation of high data volumes in 3D modeling, for example, necessitates the development of data fusion and animation techniques that permit the rapid assimilation and comprehension of complex acoustic interactions with dynamically changing ocean environments. Finally, documentation of MOS design and operation is essential for system maintenance and operator training. The GSM was designed to provide sonar system developers and technologists with a comprehensive modeling capability for evaluating the performance of (monostatic and bistatic) sonar systems and for investigating the ocean environment in which these systems operate (Weinberg, 1981, 1985b). The development approach used a modular design, adhered to a strict programming standard, and implemented off-the-shelf software when practical. The generic sonar model is presently restricted to an ocean environment that is independent of range and time. In particular, the oceanic sound speed profile is layered, the surface and bottom are assumed to be horizontal reflecting boundaries, and sonar beam patterns are assumed constant over all azimuthal angles. From a sonar system design standpoint, the significant capabilities of GSM include the modeling of passive signal excess versus range or frequency, active signal excess versus range, range and bearing errors versus range, low-frequency analysis and recording (LOFAR) diagrams, and autocorrelation and cross-correlation functions. The next lower level of investigation involves computation of the signal, noise, reverberation, target echo and detection threshold. These, in turn, require inputs of ambient noise, self-noise, scattering strength profiles, scattering spectra, sonar system responses, SL, DI, filter equalizers and eigenrays. A range-dependent (3D) version of GSM was developed by Dr Henry Weinberg, formerly with the Naval Undersea Warfare Center in Newport, Rhode Island (USA). This new system is designated CASS (comprehensive acoustic system simulation) (Weinberg et al., 1997; Weinberg, 2000). The CASS model simulates the performance of active sonar systems operating in the frequency range 600 Hz to 100 kHz. Weinberg (2000) traced the evolution of CASS from its genesis in CONGRATS, through NISSM, to GSM. The generic sonar modal used integral (or multipath-expansion) approaches such as FAME instead of the range-derivative and divided-difference algorithms that had been used in the earlier CONGRATS and NISSM models. Like CONGRATS and NISSM before it, GSM assumed a range-independent ocean environment. In CASS, all environmental parameters can vary as functions of range, azimuth and frequency. Weinberg (2000) tabulated the 30 environmental-acoustics submodels, the 26 system submodels and the 22 sonar analysis submodels comprising CASS. The CASS model computes reverberation in the time domain by accounting for the leading and trailing scattering-cell reverberation times for all possible combinations of eigenrays. Signal excess is computed at each range step by first mapping the signal into the time domain and then selecting the peak signal-to-masking level, where the masking level represents the power summation of noise and reverberation. This approach implies that the selected signal level may not always represent the time-integrated pressure level (Keenan, 2000). The propagation component of CASS is GRAB, which computes high-frequency (10-100 kHz) transmission loss in range-dependent, shallow-water environments. Favorable modeling results have been obtained for frequencies as low as 600 Hz. The GRAB model is based on Gaussian ray bundles, which are similar in form (but somewhat simpler) than Gaussian beams (Weinberg and Keenan, 1996; Keenan, 2000; Keenan and Weinberg, 2001). Eigenrays are found by power averaging test rays having the same path history (Keenan, 2000). The GRAB model is under configuration management by OAML (Keenan et al., 1998). Databases with which to support model development, evaluation and operation are available in a variety of formats. Many have automated data-retrieval features that make them attractive for application to model operating systems. Available automated oceanographic and acoustic databases have been identified and summarized by Etter et al. (1984). Two categories of data banks were described: primary data banks and modified data banks. Primary data banks contain original or modestly processed data (e.g. National Oceanographic Data Center, 1992). Modified data banks are distinguished by the fact that they modify or extrapolate data derived from primary data banks in order to satisfy operational requirements for compactness or for ease of handling (e.g. Naval Oceanographic Office, 1999). Parameter summaries for primary data banks are provided in Table 10.4. Not all of these data banks are fully documented, and some may not be available for use outside the custodian's facilities. This summary does not claim to be exhaustive. The US Navy has established sets of databases as standards for use in sonar modeling. These databases are maintained in the oceanographic and atmospheric master library (OAML), which is chartered to provide fleet users with standard models and databases (Willis, 1992; Naval Oceanographic Office, 1999). A subset of these databases is available through the tactical oceanography wide area network (TOWAN). Selected TOWAN databases are summarized in Table 10.5 together with brief descriptions of their contents, temporal resolution, and spatial coverage and resolution. Related information on websites is provided in Appendix C. It should be noted that the US Navy strictly controls dissemination of the OAML databases. The accessibility of many of these databases has been facilitated by the US Navy's technology transfer program. One such example is NEONS (naval environmental operational nowcasting system) developed by the Naval Research Laboratory (NRL). NEONS manages three types of environmental data: observations, images and gridded data (Schramm, 1993). The Naval Research Laboratory designed NEONS for compatibility with computer-industry and international data-exchange standards. NEONS supports civilian distribution of FNMOC data products via the Navy-NOAA oceanographic data distribution system (NODDS).